makes functional and traditional stoneware that can be used in the microwave, dishwasher and oven. Items they hand turn range from coffee mugs, pie plates, large vases to miniatures, dinnerware pieces sorry (No Plates) honey jars, candle cups of many styles, lotion bottles, toothbrush holders, canister sets, large and small casseroles, and just a lot more. Their specialty is a hand turned basket with hand made flowers on top and both sides. They always special sign that piece with Bruce's full name which has become his Signature trademark piece. Colors range from antique/brown edges, antique/ blue, colbalt blue, light blue with lace, medium blue that breaks brown on the edges, deep burgandy, black, dark green, purple, white with burgandy, green, or blue trim. Spongeware in rose, rose & green, green & blue. All the pottery incorporates lead free glazes and all pieces are hand turned. A lot of people tell Bruce he turns thin like JB Cole Pottery. 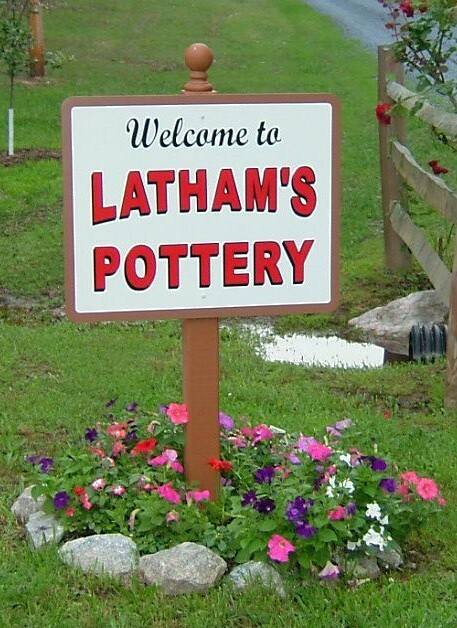 Bruce & Janice take pride that they do all of their work at Latham's Pottery from start to finish. Their pottery is Traditional Seagrove NC Pottery. Directions: From Town of Seagrove at stop light head North on 220 Alt (Broad St) in Seagrove go 2 miles look for Latham's sign on the right. From Asheboro on (73/74 220 Bypass) Take Exit #66 New Hope Church Road (Area Potteries next 6 exits) left off exit then right onto Alternate 220 just follow pottery signs. Latham's Pottery will be first Pottery on Left pass ( Primavera Italian Restaurant ) formally Jugtown Café). Groups large or small are always welcome, please call ahead to set up a time for demonstrations. Vist Us on TripAdvisor and help us get noticed! 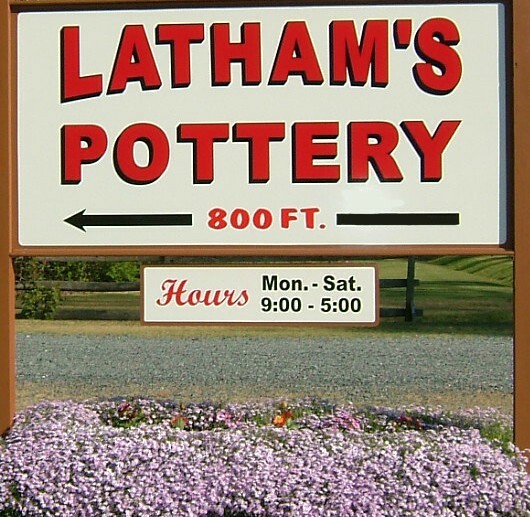 Latham's Pottery Is Closed on these Hoildays! Thanks for Visting Our Site! 336-873-7303 if you need to reach us!